In this new online course, based on the Three Principles Sydney Banks uncovered, you will discover and integrate with your own True Nature. This will give you an opportunity to share your voice of wisdom with the world, create a life after your unique style and to live in a feeling that life is a gift meant to be enjoyed. We are calling this an “online-offline course”. You will be joining Elsie on live group chat 4 times during the first 2 months. Then you´ll have 1 month “off” to reflect and live in your new understanding. After 1 month off, you´ll join for live group chats 4 times over the next 2 months. In total you´ll participate in 8 live group calls. The formless spiritual nature of Mind, Consciousness & Thought and how we are the Principles in action. How our own personal thinking is the only thing holding us back from feeling deeply connected with Life. That Wisdom «is» our back and that we can lean into a more relaxed way of living when our Wisdoms unfolds. How deep listening from our core consciousness will cultivate more understanding in our life and enhance our ability to help others. Discover how we can enhance our family life, business, and every other relationship through a soul to soul connection. How our personal mind (intellect) can work in partnership with Universal Mind / Wisdom. Discover how we «chat» with our own Wisdom instead of counting on others´ wisdom, and why this is important. "It is a privilege to be mentored by Elsie Spittle. She has been an inspirational role model for me in her commitment to her own learning and development. She brings this spirit and sensitivity to her mentoring. So you get a clear, uncompromising but gentle experience of a deeper more fundamental feeling and perspective. Elsie is totally on your side. Working for you to realize and experience for yourself, so you can stand on your own understanding. No one has a purer commitment to this coupled with an incredible sensitivity for the right direction." "If you want to go beyond an intellectual understanding of the mind, spending time with Elsie is like taking a warm bath in the deeper feelings of peace and well-being at the heart of the Three Principles understanding." "I chose to work with Elsie as a mentor whilst my business was going through a rapid stage of growth and I had many demands on my time and my energy. The sessions had a calming effect on my spirit, reminding me of who I am and what was important to me. I found that I tackled issues and found solutions with more grace and ease. I would often have already answered my own questions just by thinking about what to talk to Elsie about. Her pragmatic approach and her no nonsense way of pointing to the truth would inspire me every time. I regard Elsie's guidance as a key component to ensuring my business is grounded and my spirit is nurtured." Elsie Spittle has been an internationally recognized trainer and consultant for over four decades. She is in the unique position of having known Sydney Banks, originator of the Three Principles, before he had his epiphany. She witnessed the extraordinary change that occurred in him and the unprecedented impact his work had on thousands of people, and how this has brought about a new paradigm in the fields of psychology and psychiatry. Elsie had the privilege of receiving “on the job” training directly from Mr. Banks, travelling with him to address mental health practitioners, educators, and others seeking a deeper understanding of life. She is considered the first formal teacher of the Principles, after Sydney Banks. She is highly regarded as a public speaker and in her ability to reach the audience, large and small, via a “feeling” that touches the heart and soul. She is sought after for mentoring practitioners. 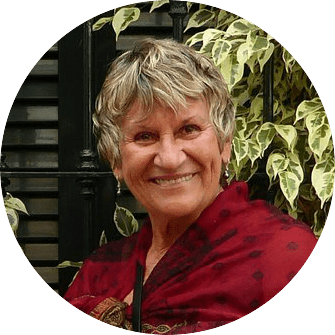 Elsie is co-founder of the Three Principles School, based on Salt Spring Island, BC. Elsie is the author of 5 books; the latest is The Path to Contentment, 2018. In total 8 live and interactive Zoom group calls, each lasting 90 minutes. Time: 12:00 PM Pacific time. You will get recordings for replay afterwards up to 6 months. The course costs $ 2000 US per person. If you want to secure 1 out of 12 spots, you´ll pay $ 1000 US deposit once your application is accepted and $ 1000 US in 7th of January 2019 when the course starts. A basic understanding of the Principles is required to participate. If you feel drawn to apply, please fill out the application and we will get back to you.